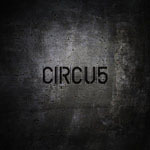 Share the post "Album review: STEVE TILLING – CIRCU5"
Pronounced ‘Circa-5′ (so why not call it that?) this debut album from Swindon based songwriter, vocalist and multi-instrumentalist Steve Tilling is a hugely ambitious affair. Firstly there’s the Steven King/X-Men style storyline concept – tracing the life of a child raised as a psychopath by a secret government organisation, aiming to cure the condition while harnessing certain traits for business and military means. 5 years in the making and featuring guest performances from Dave Gregory (XTC, Big Big Train), Phil Spalding (Mike Oldfield), Matt Backer (ABC), Alan van Kleef (Rachel Stamp), Johnny Warman (Peter Gabriel) and Andy Neve (Steve Hackett), the album is the collision of edgy alt-rock and prog. Although with the doom laden artwork and imagery, and abrasive song titles like – ‘My Degenerate Mind’, ‘Days Erased’ and the five movement that make up the centre piece The Chosen One – ‘Baptism’, ‘Transfiguration’, ‘Crucifixion’, and ‘Resurrection’, the expectation may be for something with more metallic under/over tones. But in reality CIRCU5 harks back to the glory days of progressive rock and one comparison in particular – Home’s classic 1973 offering The Alchemist – seems to tick a lot of similar boxes in its balance of light and shade. Naturally, a broad spectrum of styles are covered – from harder hitting numbers like ‘My Degenerate Mind’, ‘Stars’ and ‘Blame It On Me’ which border on Foo Fighters/Queens of the Stone Age territory, through elements of classic King Crimson, Yes, and Gentle Giant in the epic centrepiece ‘The Chosen One’, to more pastoral elements that bear comparison to Tull, and folkie Zeppelin. There’s even a (thankfully brief) semi-spoken word section in the apocalyptic ‘Days Erased’. With so much ‘going on’ (‘The Amazing Monstrous Grad’y, for example, covers ground trodden by acts as diverse as Zeppelin and The Sensational Alex Harvey Band) CIRCU5 needs repeated listens before fully revealing its plentiful delights. And there are many. And unlike many concept albums, the component parts work equally well listened to in isolation. Tilling may not be the most technically gifted of vocalists – in his quieter moments there’s almost a hint of Don Henley to his delivery (as on The Chosen One – ‘Baptism’), but at least he carves his own niche, and it’s nice to hear an album where his instrument of choice – the bass – is given such a prominent part (Chris Squire, would no doubt approve). This entry was posted in ALBUM REVIEWS, ALBUM REVIEWS (Mobile), All Posts and tagged ABC, album, Big Big Train, CIRCU5, Dave Gregory XTC, Johnny Warman, Matt Backer, prog, progressive, review, rock, Steve Tilling. Bookmark the permalink.